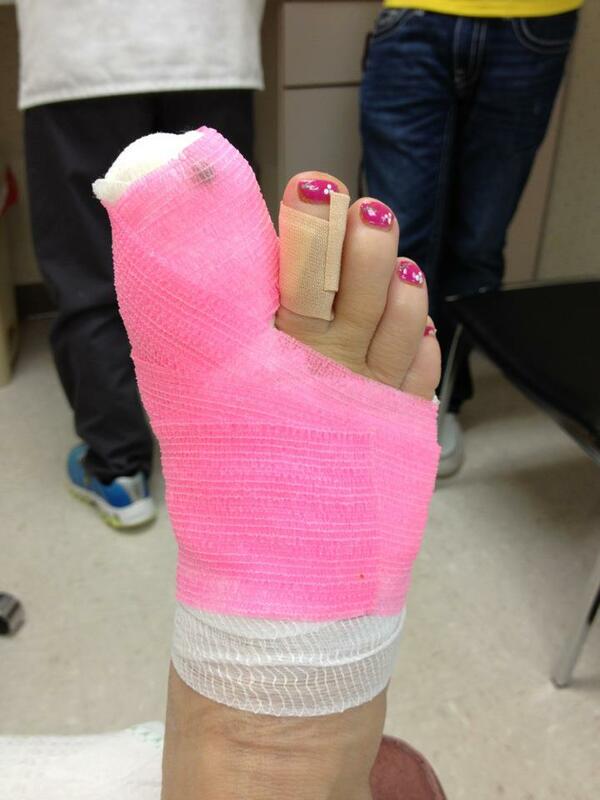 Recently I celebrated the 3 year anniversary of The Big Toe Break, or “compound fracture” as it’s medically called. I always thought a fracture was a crack, but now I know it’s a break. And a compound fracture means the skin was broken. Mine was definitely a compound fracture. I guess if you’re going to do something, do it all the way! Freshly wrapped after my first follow-up visit. I broke my big toe a week after I tested for Shodan. Prior to my test I was tired and klutzy, so I was extra careful about anything I did in class. The week after my test I was still tired and klutzy, but was no longer wrapped in bubble wrap and wasn’t as cautious since the test was already over. I was doing a leg sweep in Black Belt Class. 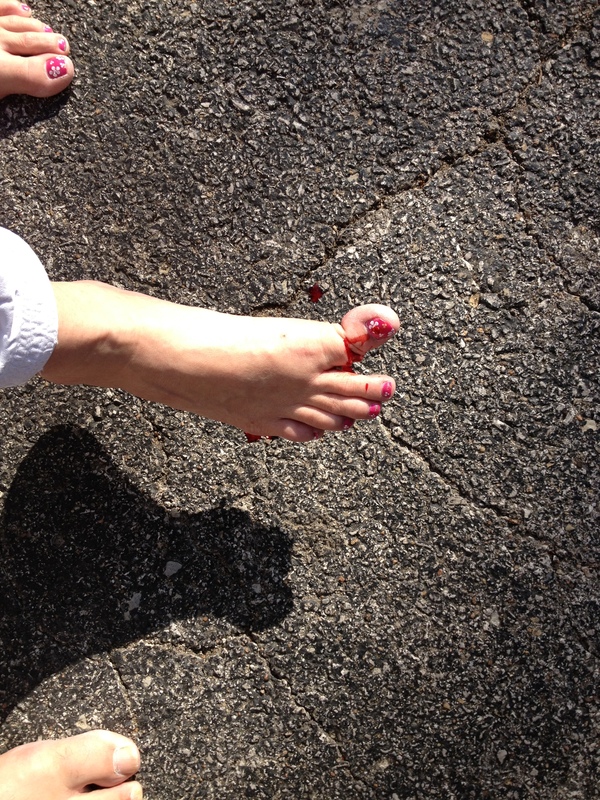 You wouldn’t think throwing someone else would be trouble, but that’s how I broke my toe! I planted my foot behind my uke, Andy, then stopped to think about what I was doing, and after a few seconds continued with the sweep. I really should have started all over again, but now I’m just Monday Morning Quarterbacking. I’m not exactly sure what happened but somehow when I took Andy down I went with him. He jumped up and I rolled over and sat up on my knees. Kyoshi asked if we were OK. 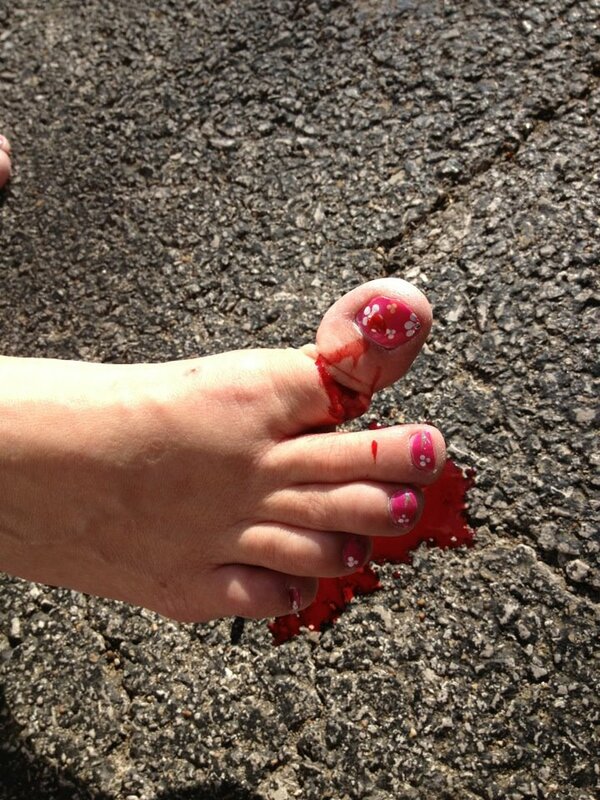 I said I was, but thought I jacked up my toe. It didn’t hurt but it felt a little funny. No big deal, or so I thought, until I heard one of the students behind me say, “Um, there’s blood.” Well, that got everyone’s attention, including mine! Newly broken and on the way to the hospital. I wanted to turn around to see it but the other students were reluctant to let me look. Finally they let me turn around, but someone pulled my shoulders against their legs to support me. I certainly wasn’t prepared for what I saw! Contrary to freaking out, I was really curious. I’d never seen anything like that in my life and I wanted to look at it more closely! I’m pretty sure I could work in an emergency room or trauma unit and hold it together. I wasn’t in pain, so I was more curious than anything. Well, the guys only let me look at it for so long and then it was decided that a) I should stop bleeding all over the mats; and b) someone should take me to the emergency room. 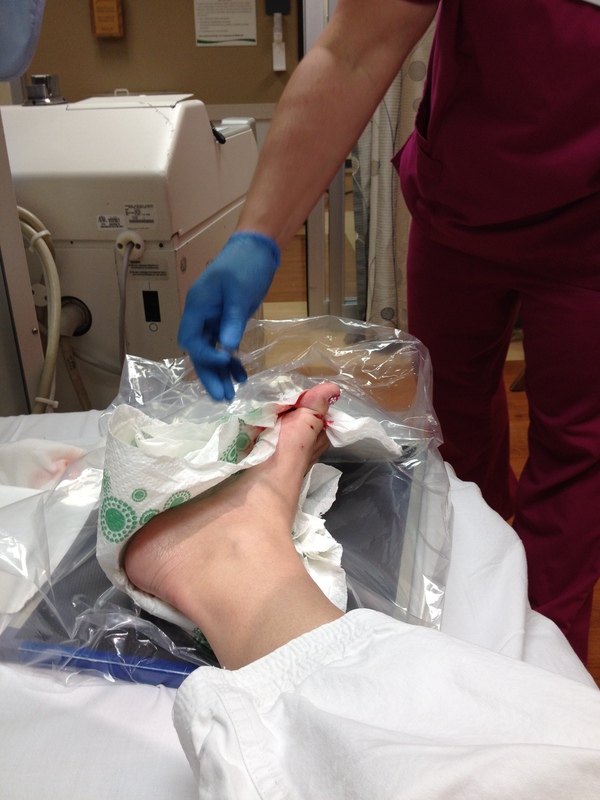 They wrapped my foot in paper towels, put a mat on the floor of a truck, and Uke Andy became Ambulance Driver Andy. After checking my crazy-level to see if I was serious, Kyoshi used my phone to take a few photos. Aren’t you glad? Personally, I think they’re pretty good shots and the color was quite vivid! I was even asked a couple of days later asking if the photos had been photo-shopped as an April Fool’s Day joke (I broke it on March 31st). Well, long story still long, after a couple of delays due to “real” incoming traumas, I was put under and the doctor got to work. He put in a pin to hold the bone steady and a long stitch to close up the rip. After the stitch was removed. The pin had to stay in another week – the bone wasn’t healed enough. The pin was in for a few weeks, the stitch not so long. I was in a boot for 6 weeks, which I did not enjoy. I blinged out my boot because it was ugly, and I became known at the podiatrist’s office as The Girl with the Blinged Boot. Three years later, I have nearly full range of motion in my toe. It looks straight but it doesn’t bend all the way. I can tell when a storm is coming in by the ache. Sometimes it hurts after I work out on the mats. But for the most part, it’s more normal than I had hoped. The podiatrist was amazing! Despite being pulled off the golf course to attend to me, he took great care of me. He told me, “You are one lucky lady!” I agree. 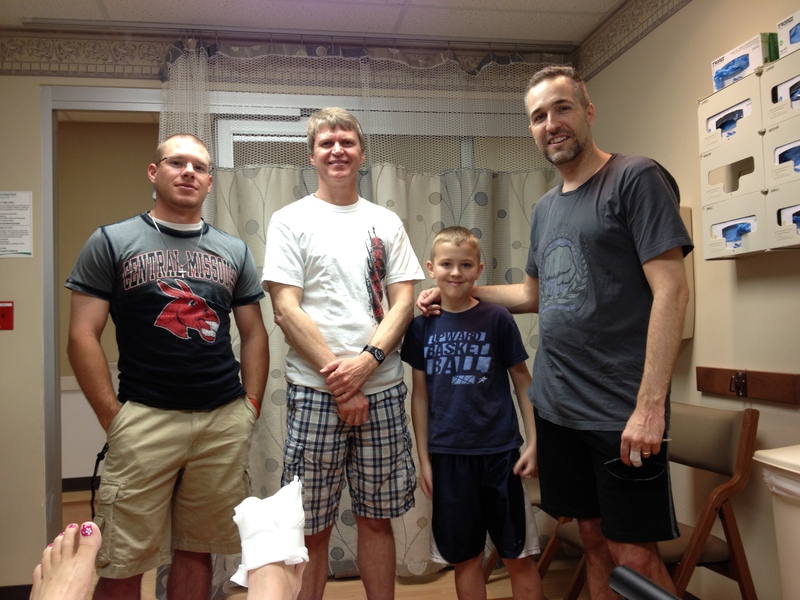 Lucky to have an amazing podiatrist, lucky to be healed. I posted this to FB. Didn’t look so bad on my little phone screen but it grossed out more than a couple of people. 🙂 I didn’t realize you could see the bone sticking out! Waiting in the ER. It didn’t hurt until the doctor stuck a needle in my toe to numb the pain. Party in the ER! My son (sorry I ruined your golf plans!) and Karate friends. After the pin was pulled. Looks pretty good, doesn’t it? 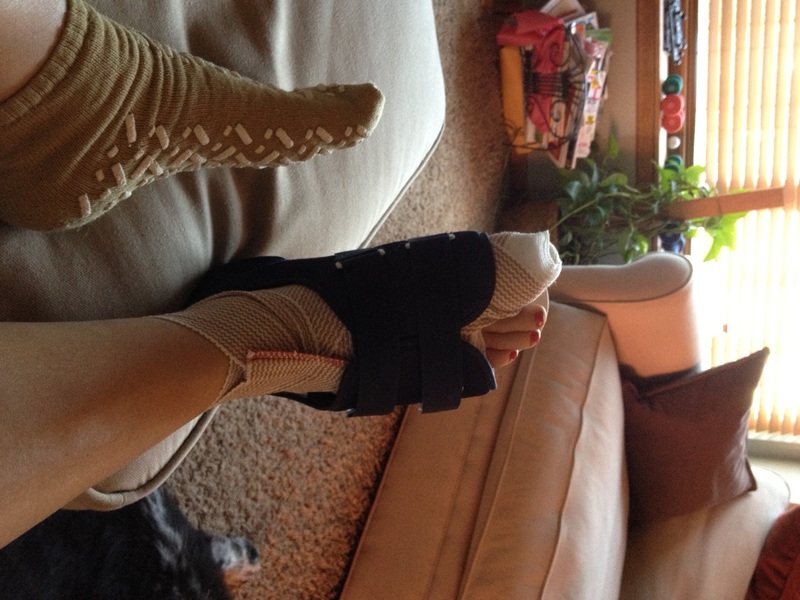 Home, Sweet Home with my really lovely boot and a hospital sock! 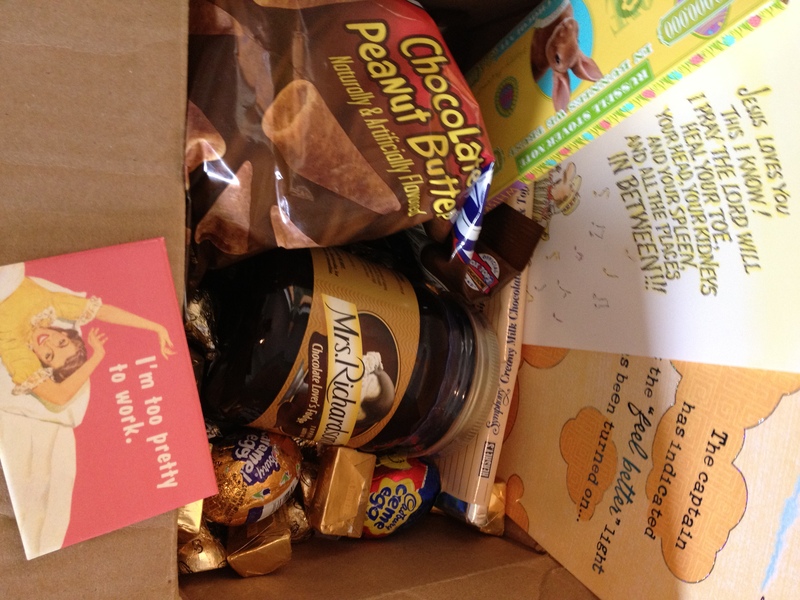 Get Well Package from my sisters made me smile!